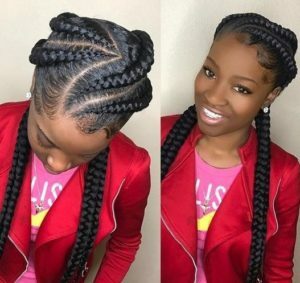 Cornrows are an amazing way of styling your hair in unique and creative ways. The styles you can create with cornrows are limited only by your imagination. 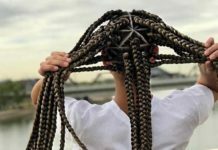 There are things to bear in mind when installing cornrows, however. 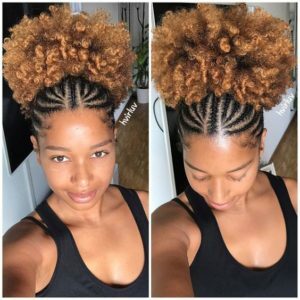 For one, you should ensure that your hair is well moisturized, particularly if you intend to wear the style for several days or weeks. 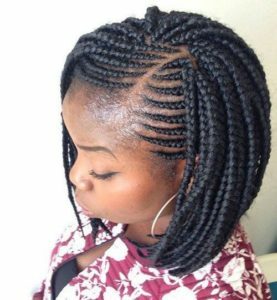 It is also imperative that you are gentle on your edges and avoid creating tension on the scalp. 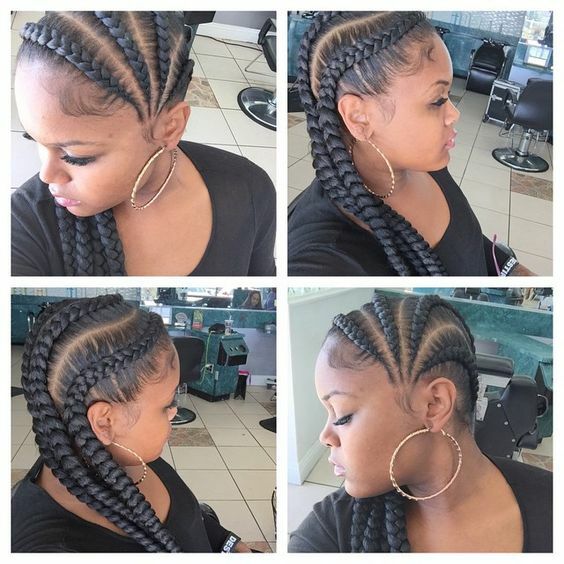 This goes double if you use extensions as the weight of the added hair can cause damage. Cornrows are great and appropriate for any and all occasions. Here’s a sample of the looks you can create. The key to large cornrows is to ensure that the hair is sleek and neat. 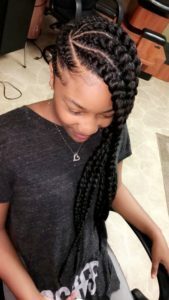 It is also important that your parts are clear and defined as they are a huge factor in creating the look of your style. Your cornrows follow the direction of your parts, so creating your look starts there. Add extensions for cornrows that are both fuller and longer. Is there any style more universal than a ponytail? 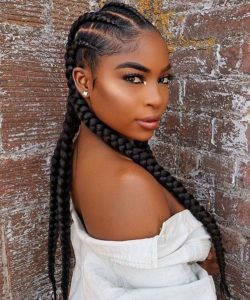 A key feature of this hairstyle is using a few of your braided ends as the ponytail holder. It really makes the look pop. Short hair don’t care! 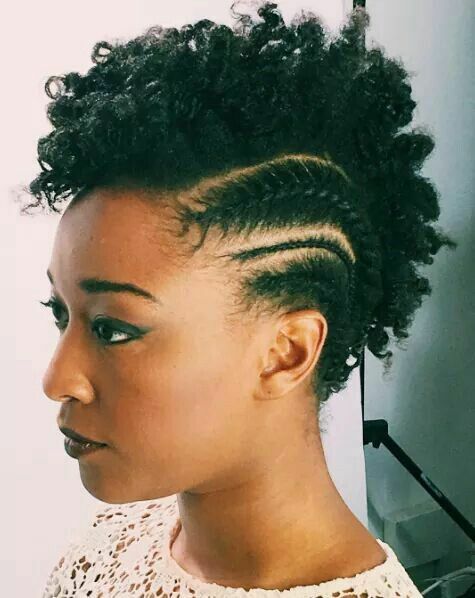 This is the perfect style for TWA length hair. Separate your hair in three equal sections from front to back and cornrow the sides leaving the middle section loose. 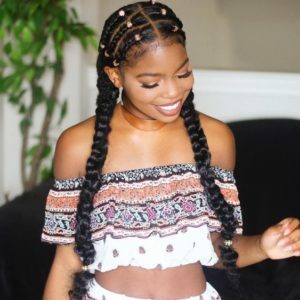 On either side of the head place, two medium sized cornrows with a small cornrow in between them Twist the middle section for a twist-out and voila! 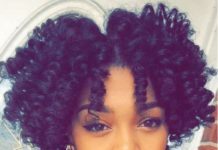 Braid outs, coil outs, and perm rod sets are also great ways to create curls in the middle section. This look is simple, casual and so cute. 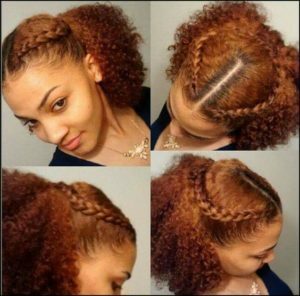 Part your hair down the center of your head from front to back. Create your cornrow starting at the beginning of your part working towards the back, stopping the cornrow just beneath your ear. 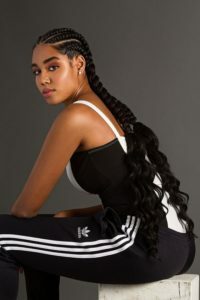 Gather the loose hair into a ponytail with a ponytail holder. 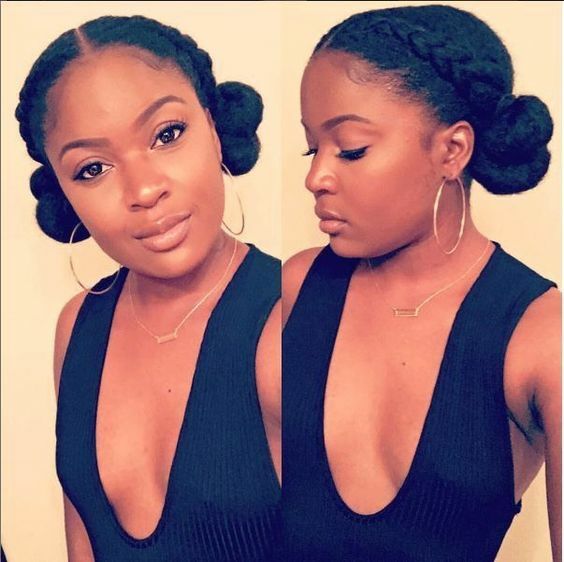 Create a two strand twist then wrap it around into a bun and secure. Repeat on the other side. Apply some gel or edge control to your hair and then tie it all up with a scarf to set. 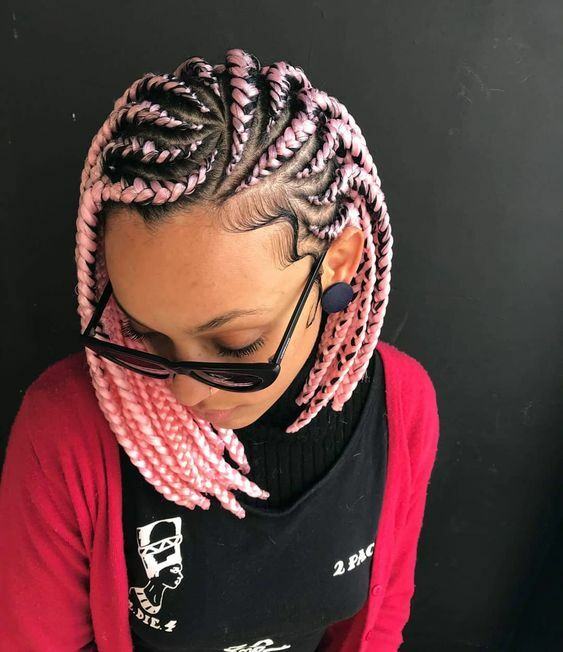 These zigzag cornrows live and die by the parting which is the key to creating this style. Keep your zigs and zags about the same for a polished look. 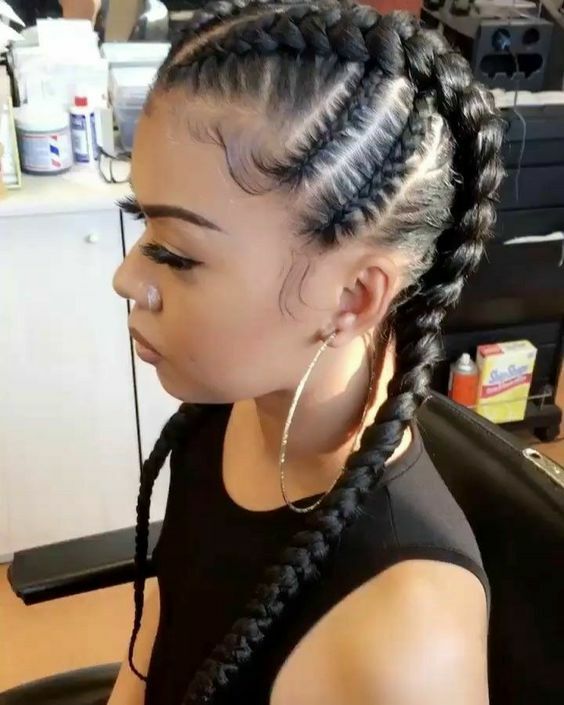 This look is made unique by being parted to the side instead of down the center. 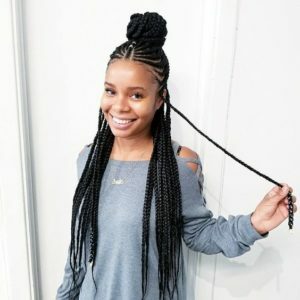 Braid your ends all the way down, adding extensions for fullness if desired. Wrap the ends around and pin in place for this elegant braided bun. A common way to wear cornrows is to have two cornrows going down each side of your head. What’s unique in this case is that the cornrows are loosened to create a fuller look. Keep the rest of the hair sleek to ensure the style looks well done and neat. 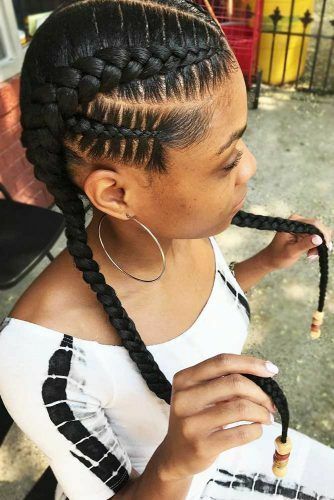 This look is one from which many others can be created, which makes this cornrow style super versatile. 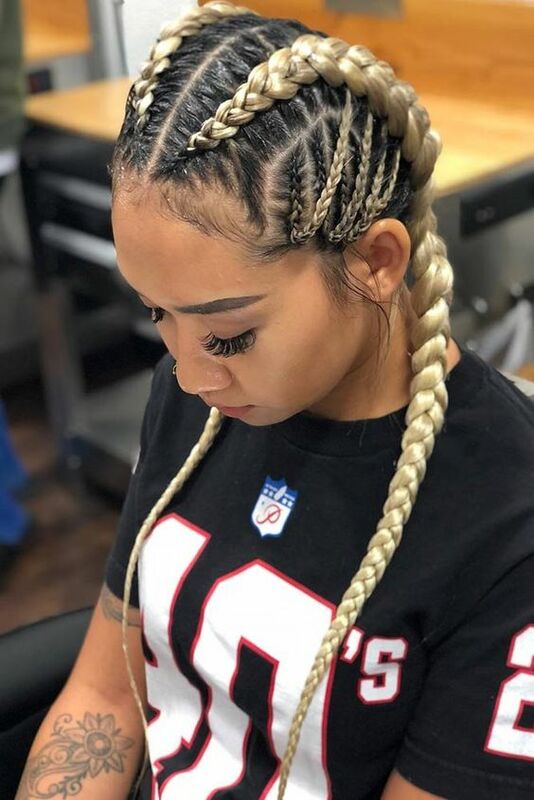 This is an example of the kind of style that requires particular attention to be paid to the edges in order to prevent pulling and tugging on the hairline. 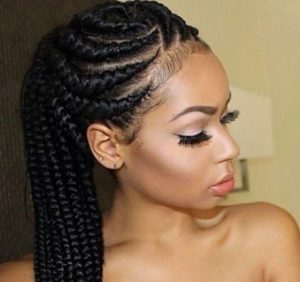 The double cornrows look is absolutely stunning and chic! 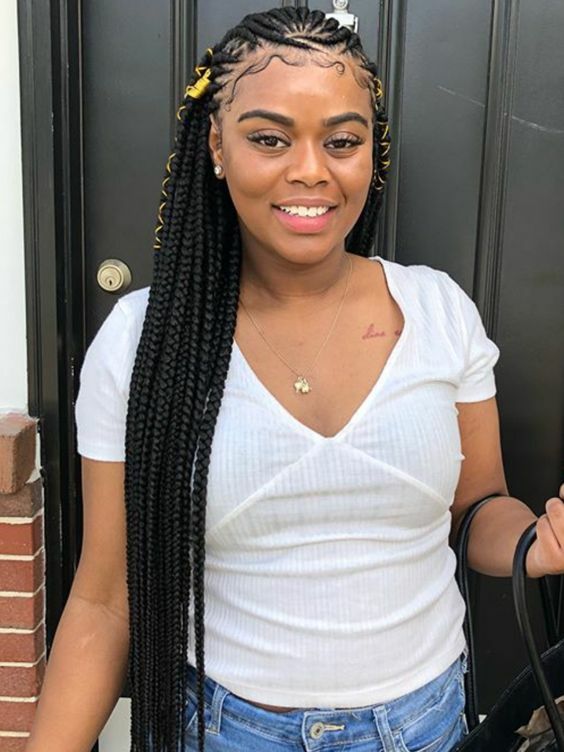 Jazz up your cornrows by adding beads and hair jewelry. Love having your hair to one side? This side-swept look is for you. All the cornrows are done from one side to the other to create this look. Twist the ends of the hair for additional texture and contrast. 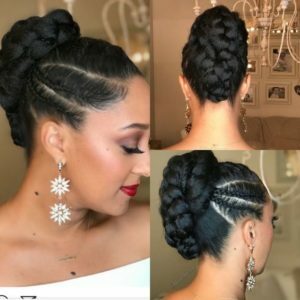 Next time you’re thinking of doing a high curly puff, how about you mix it up a little by adding cornrows at the front? 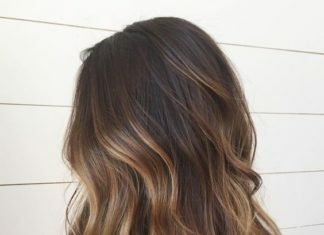 It’s a striking way to rock your hair, particularly if it’s two toned as shown here. Isn’t this just absolutely adorable? 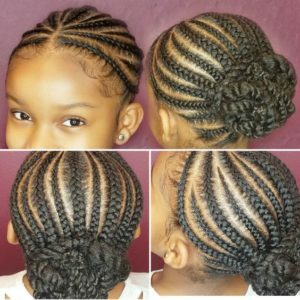 Cornrows are a great way to style your child’s natural hair. 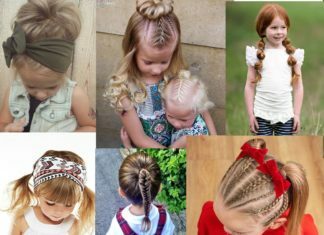 The styles last a long time and the hair is protected and allowed to thrive. This style starts with a central part from which all the cornrows come and the parting, with a hint of a curve, creates even more elegance. Twist the ends and pin in a bun to complete a style you’re little one will love. 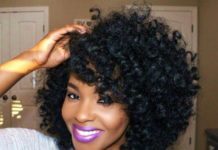 This is a quick and easy way to style your hair, especially if your curls are old, but you’re not yet able to wash your hair. 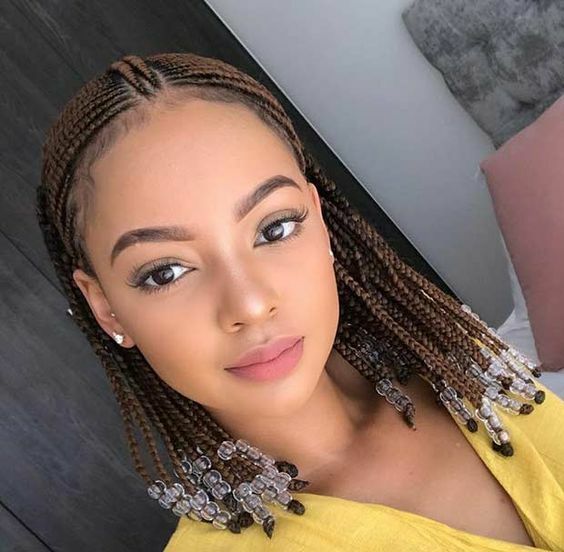 Simple cornrow the top half of your hair in two and pin it back so that the cornrows form a crown and you have a look suitable for pretty much any occasion. Doing a few cornrows around your head helps keep them protected from the tension of being pulled back and it makes for a nice twist on the usual two side by side cornrows style. 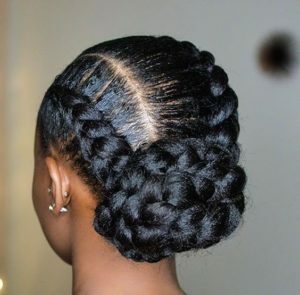 Tuck your ends away and go about your business knowing that your hair is protected. This hairstyle is the perfect cornrow up-do for a wedding or other formal event. 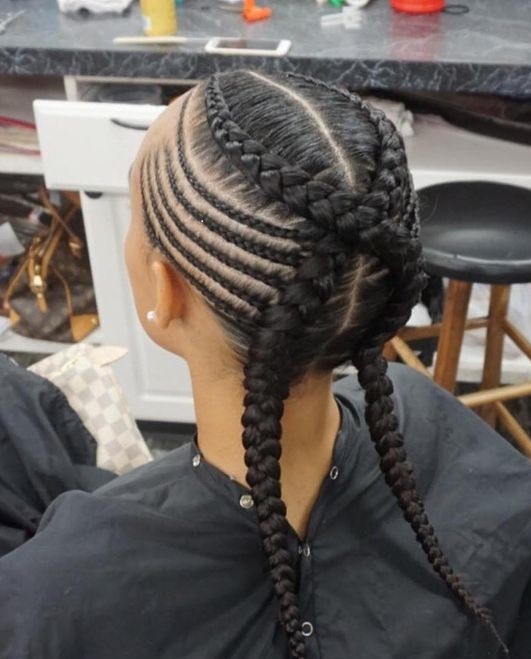 The cornrows add interest to the style that would otherwise just be a regular old ponytail. The bun is also very unique and also gives off a cornrow vibe. 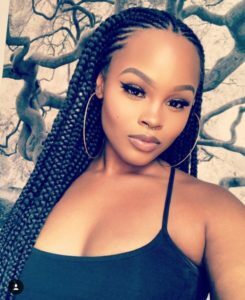 Placing smaller corners between larger ones is another way to add a little something special to a cornrow ponytail up-do. This is also where I remind you to take it easy on your edges. What’s better that putting one small cornrow between two larger corners? 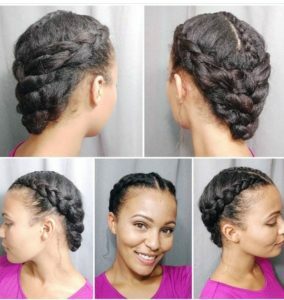 Putting two small cornrows between larger cornrows. The pattern and parting makes the style fresh and outside the box. 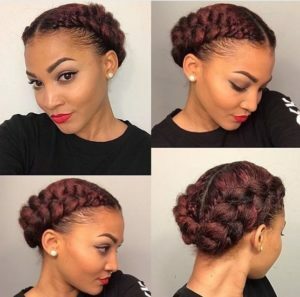 This cornrow up-do is great for everyday wear. From work, to school or play, this simple style will serve you well. The twisted bangs may be styled in different ways which ensure that you can change it up and prevent boredom from setting in. Look at that big, gorgeous bun! 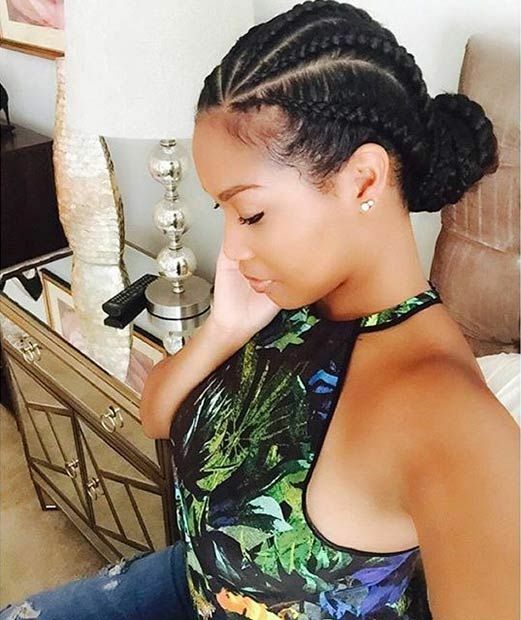 These cornrows and that bun will have you turning heads. 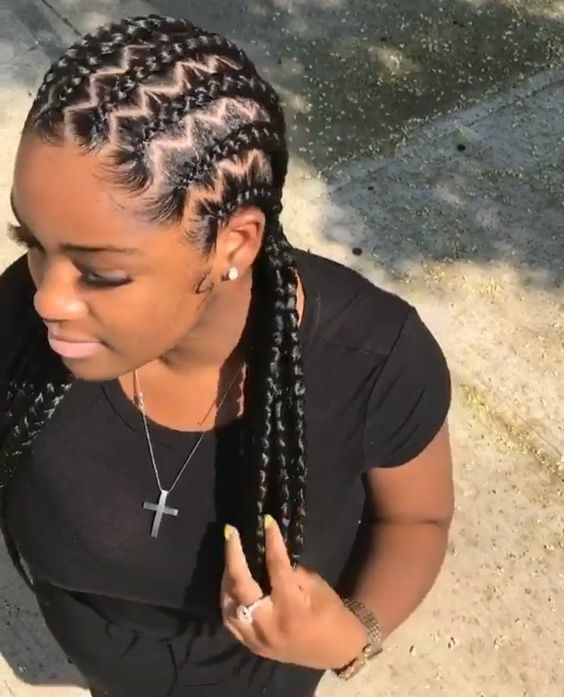 This is another variation on the two cornrows going down the side of the head that my mom and probably your mom used to do. 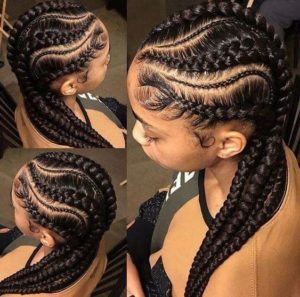 The showstopper here is the beautiful cornrow that goes down the back. You really should try this. 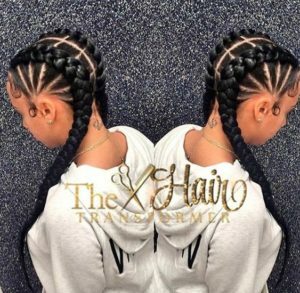 If side parts and jumbo cornrows are your thing, then this style is for you. 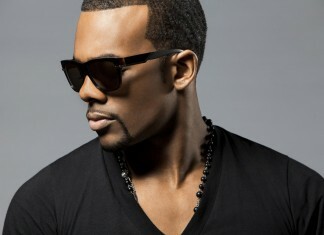 One great thing about this particular style is that it is sleek without requiring tugging and tension on the hairline. This is another cornrow style that’s going to help save your edges. Sleekness isn’t a feature of this style; in fact, it’s supposed to be laid back and a little bit messy. This is another great way of combining different sizes of cornrows to create a unique look. This look also plays with different colors which are another great way to make a style standout. 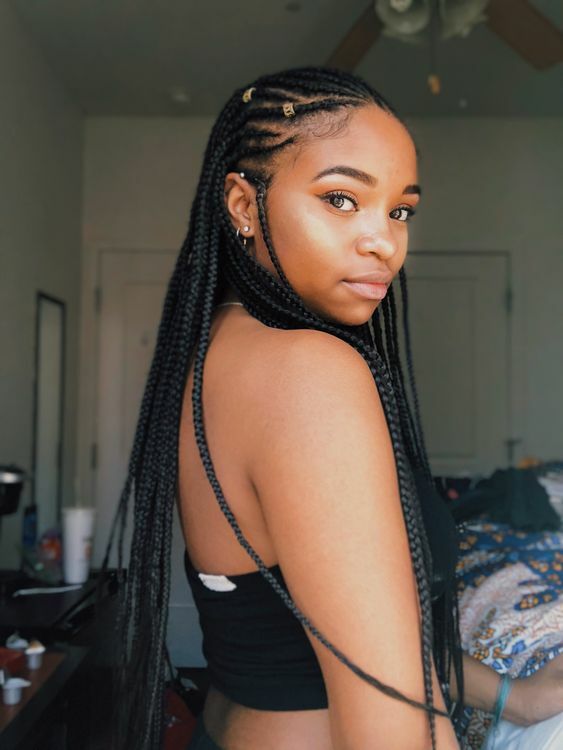 This style is all about your favorite side. 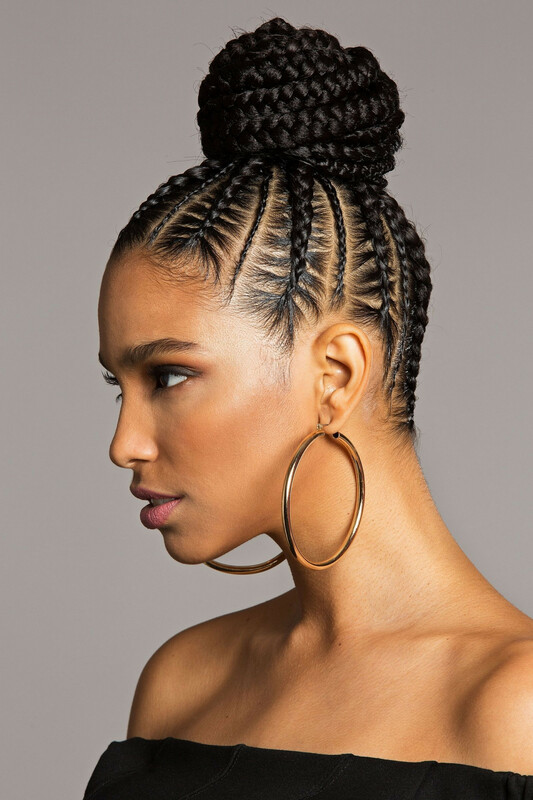 The cornrows are simple, but knowing your best side makes a huge difference. 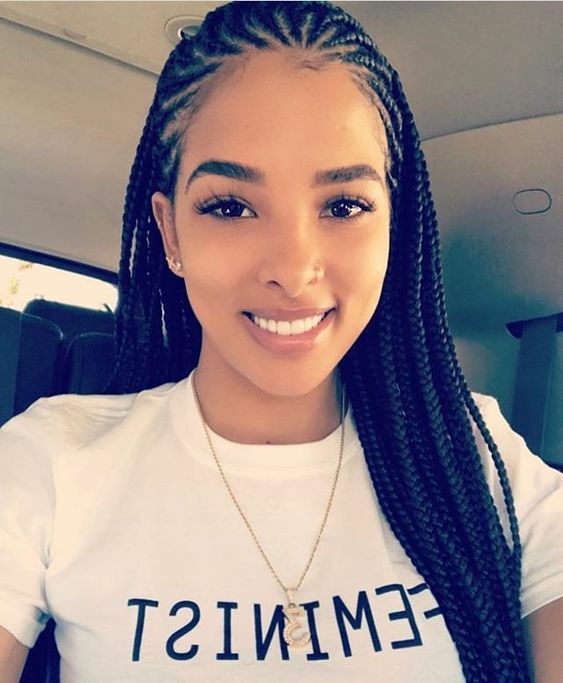 Cornrows are all the same, more or less. 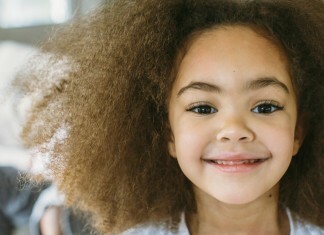 What’s makes a smile unique and fresh is evoking visual interest with creative parting. Note how the edges are incorporated in the style here. 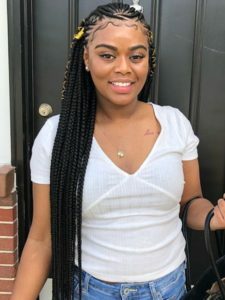 This is a great way to keep a style sleek without needing to cornrow every strand. 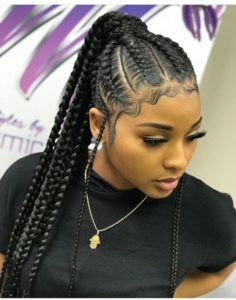 Just ensure that your edges are moisturized under all that edge control. 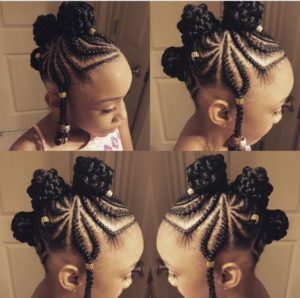 This style is super cute and suitable for all ages. The accessories here also elevate the style. Frohawks are for the funky. Can you rock it? This style needs to be moisturized frequently to ensure the hair does not become dry and brittle. 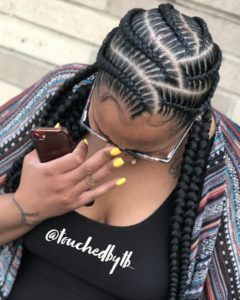 The curly ends on these cornrows take something we are used to and make it fresh. 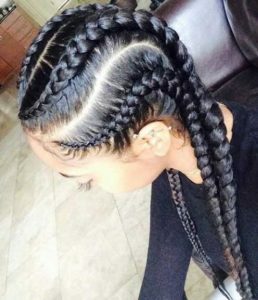 With cornrow styles that is what it is all about; being inventive. Bob lovers everywhere rejoice! This is a great way to pair two classics: cornrows and bobs. The pop of color here doesn’t hurt either. 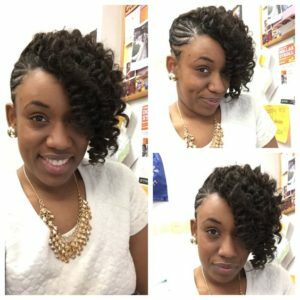 This is not your average boring bob. This style is another demonstration of the ways in which you can update a classic look and make it modern. Accessorize your cornrows with ribbons by lacing the ribbon through the hair. Take care to ensure the ribbon material is silky and will glide through the hair without creating friction. 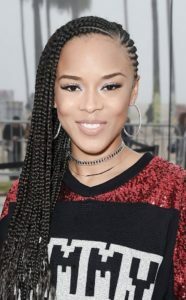 Another creative way to approach styling corns is starting them from one corner of the face and taking it to the next. 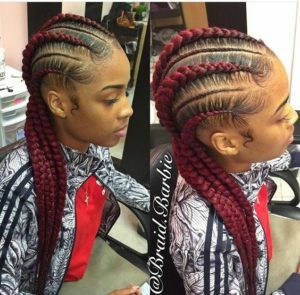 This style is yet another creative demonstration of the many ways you can part the hair to installing two cornrows. 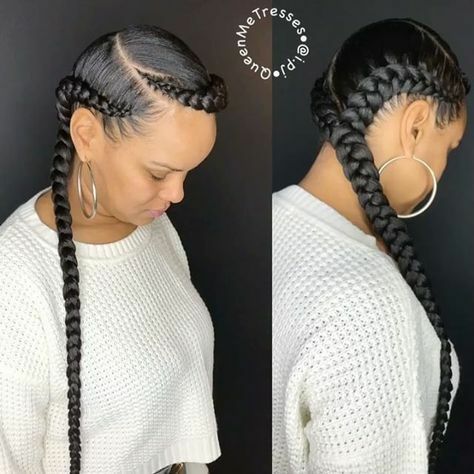 Another twist here is joining the end to create a single braid. 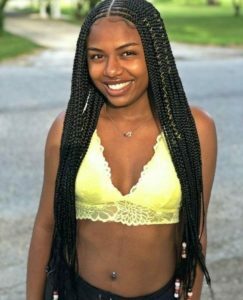 This is a simple yet creative design that is sure to stand out. 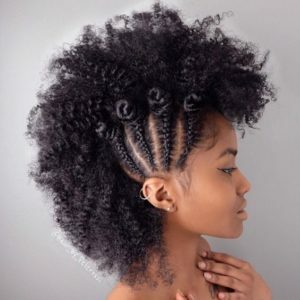 Be gentle on your edges and careful of your parts as precision is a part of what makes the style so great. 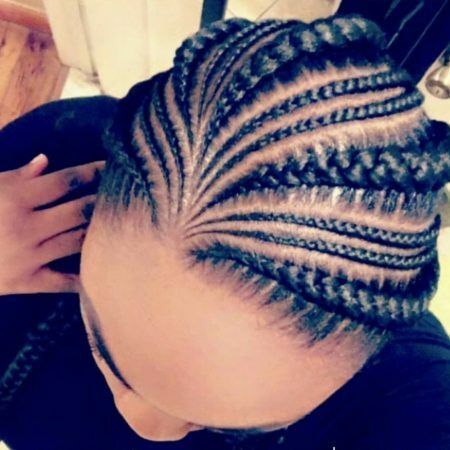 Creating small cornrows that feed into a larger one is a great way of making sure there is no tension on the hair since you aren’t pulling on individual strands to get into a single large cornrow. 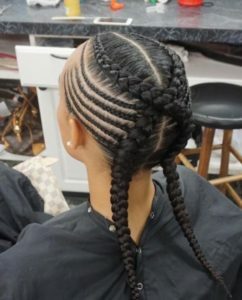 This double cornrows style is so unique. The 2 braids arelong and chunky and the parting goes all the way from the sides to the middle of the scalp. 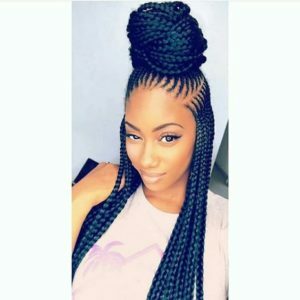 Same as the double cornrows style only with 4 chunky braids. This look is super clean and beautiful and emphasizes frames the face. 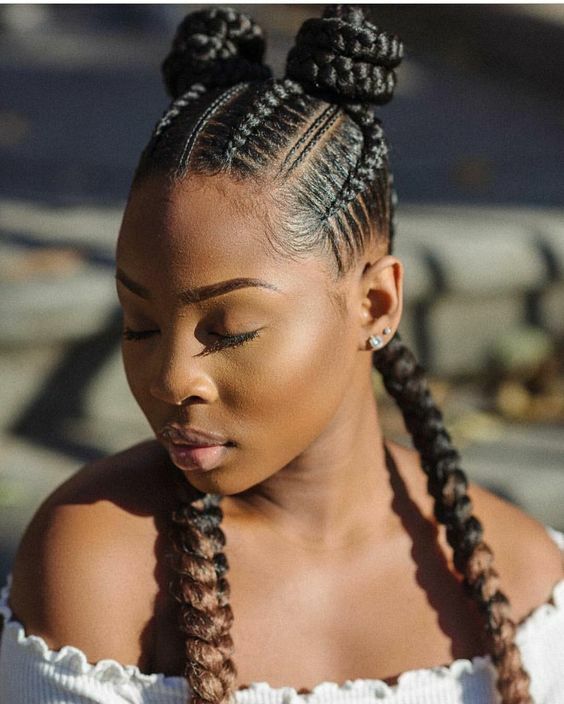 Fulani braids are one of the latest must-try hairstyles this year. These Fulani inspired cornrows ponytail is a great protective style that’s great for any occasion. These thin cornrows are so simple yet so stylish and elegant! If you want a more casual everyday look, that you can wear everywhere, this style is a must try! 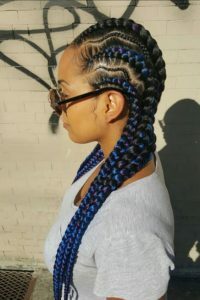 The cornrows are braided on one side while on the other side curly crochet hair is added as a side bang. 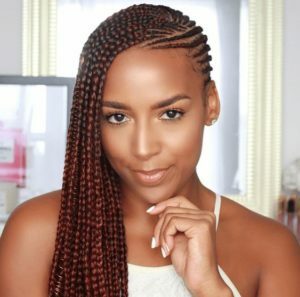 Want to set yourself apart with your cornrows style? 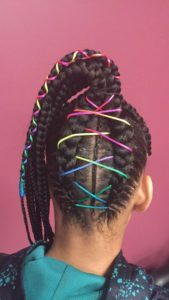 Decorate your cornrows by adding strings to one or more of your braids. 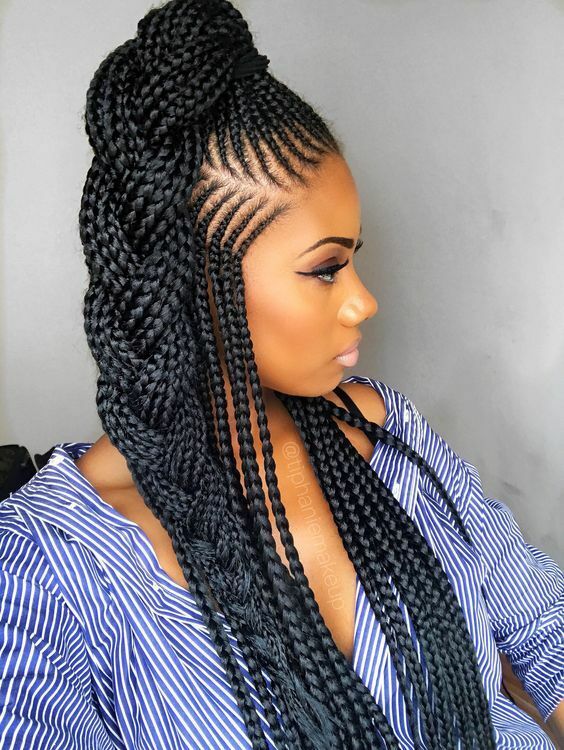 Fulani braids are all the rage right now! These super long Fulani inspired cornrows are pulled into a high bun and stay loose and long from the back and pulled to the front sides. The added jewels kes this look so unique and beautiful. 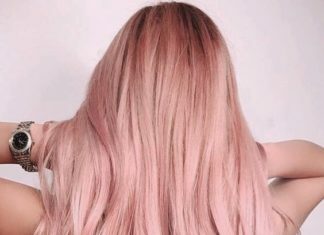 Extensions are a safe alternative if you want to experiment with color. 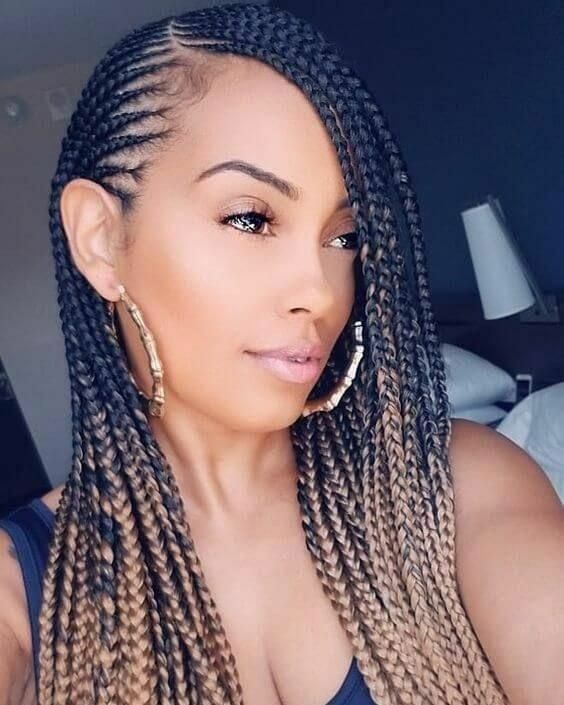 These chic ombre cornrows have a darker shade at the top that blends into a beautiful blonde color. 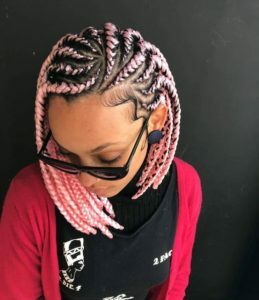 here are so many creative ways to styling your conrows. This braided style combines think and thin cornrows attached to the scalp and falling back at the nape of the neck. This style features very thin cornrows attached to the and pulled up into a high braided ponytail. For all you red lovers out there! 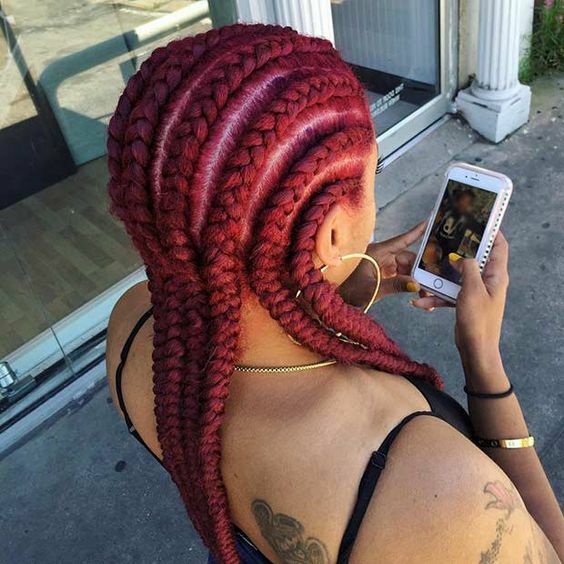 Red color is bold and go so well with any protective style! 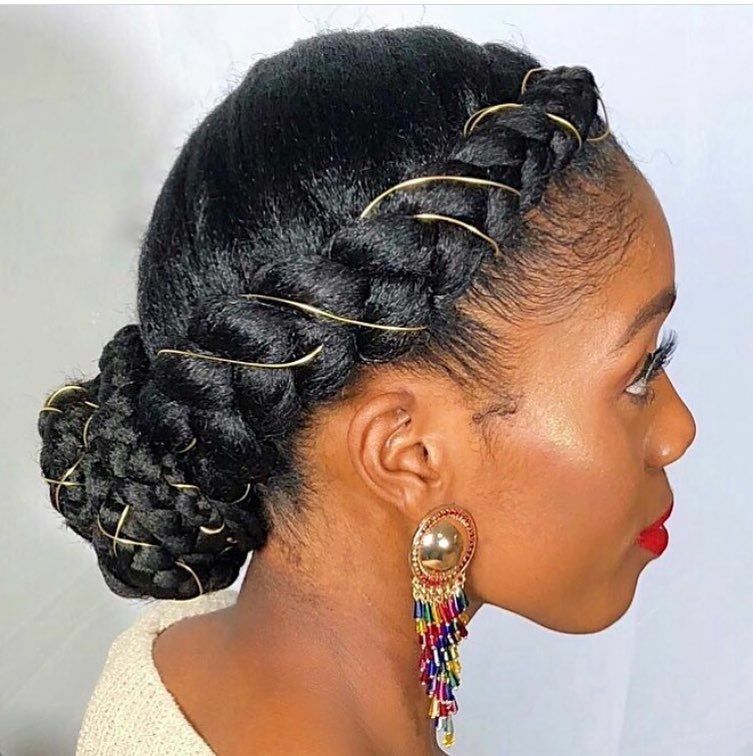 Hair rings are the the latest accessory craze an dcan really spice up your overall look! 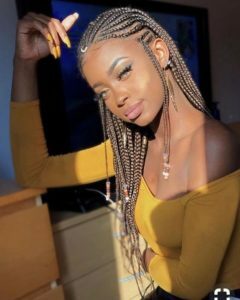 These Thin Fulani inpired honey colored cornrows are just breathtaking! 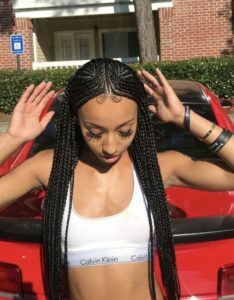 Thes cornrows are super long and thin and have a very special braided design at the top. These long cornrow braids look even more stunning with the baby hair and golden hair strings. his style is super cute and would make a beautiful protective style for your little girl. 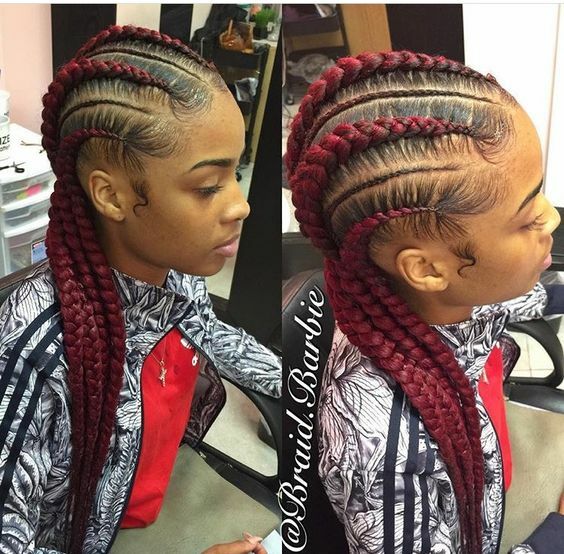 Another RAD boxer style cornrows! 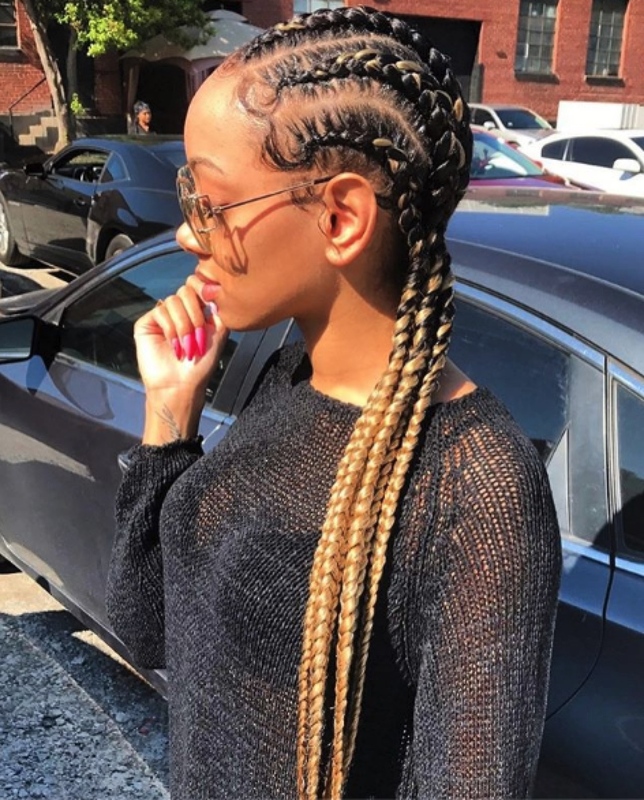 We love the mix of super thin and super chunky cornrows and the playful brown-blonde colors. 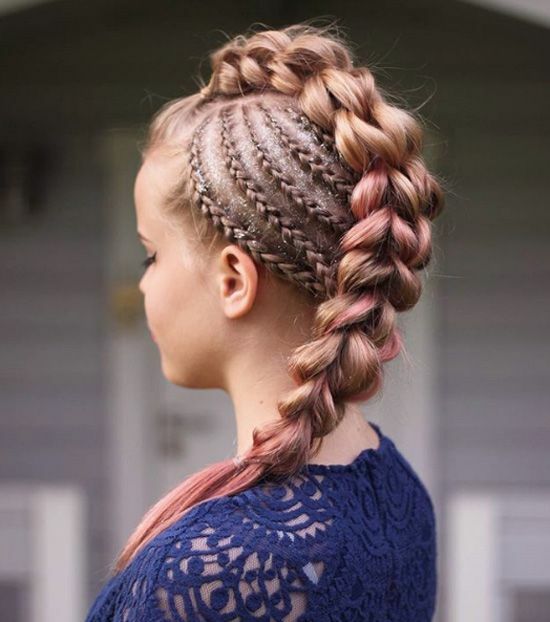 This style is by far our favorite! The curved thin braids and added purple and blue colors, make this a unique and super chic Cornrow style. 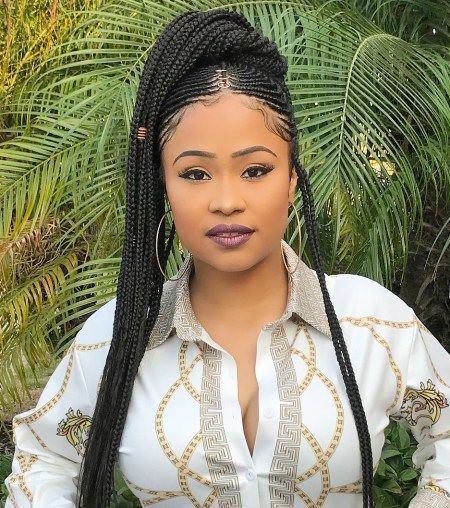 This Fulani cornrows style is pulled up into two double buns and create such a stunning and cute look, especially with the added jewels and thin baby hair at the forehead. An elegant style like this, really makes us want to rock cornrows! 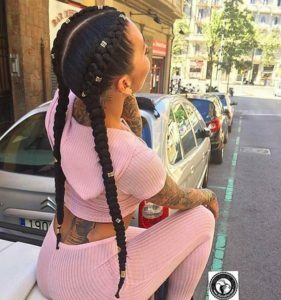 These stitches style cornrows is unreal! And is definitely one of our favorite of the bunch! 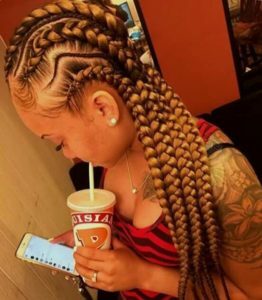 If you’re looking for a fun style, these perfect dutch braided blonde cornrows are perfect for those night outs! This style features long thin and decorated braids with a middle part. 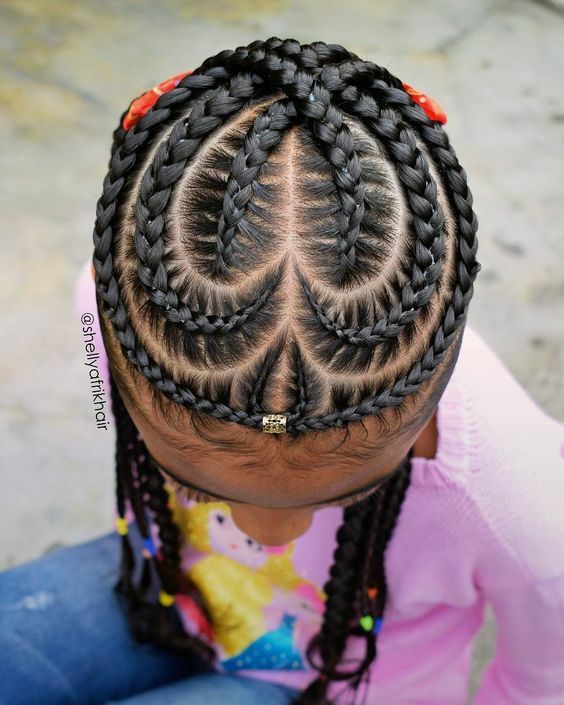 The braids are attached to the scalp right beside the middle and then left loose all the ways down. What can we say?! 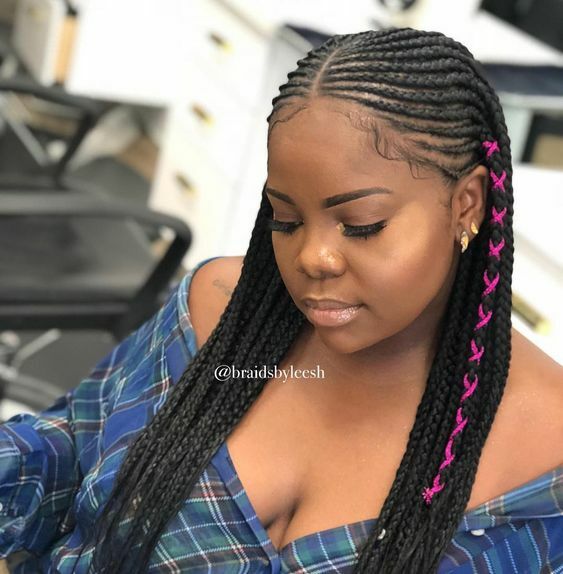 What makes this bob braided style so unique are the cornrows attached to the scalp and the fronts sides, giving volume and freshness to the look! 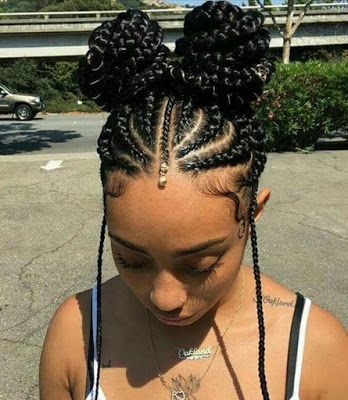 We see a lot of super long Fulani braids, but almost don’t see short Fulani style cornrows such as this one. The braids frame her face beautifully and the honey brown goes perfectly with the beads and makeup. 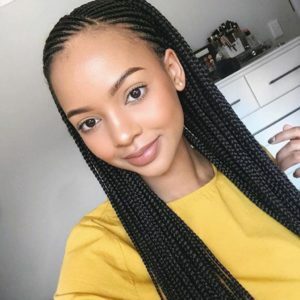 If you liked the previous long middle part cornrows, you will surely love this style. If you love bold colors, this wine burgundy shade is a must try. 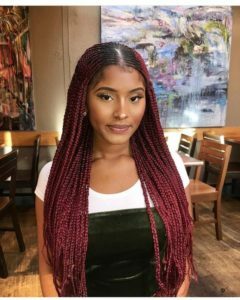 It’s never too late to join the ombre hype and refresh your look with a subtle honey brown ombre. 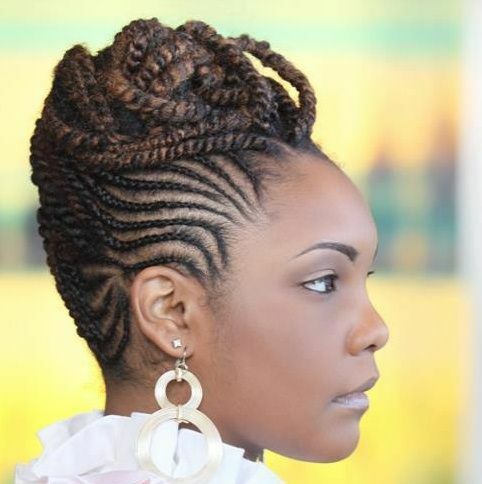 Our next hairstyle features a gorgeous classic Fulani style, accessorized beautifully with beads and jewelry. You can also wear your fulani braids in a high up ponytail. This look is much more elegant and her makeup is matched perfectly with her updo and accessories.